Increasing the efficiency of cargo transportation to the ports of Arco Norte and strengthening the competitiveness of operations at these terminals are essential factors in reducing the cost of Brazilian exports. Portogente has addressed this issue for at least five years (check links throughout this text) and reinforces the need to unload grain in ports such as Paranaguá (PR), Santos (SP) and Vitoria (ES). After all, the National Association of Cereal Exporters estimates that the Brazilian soybean producer, for example, spends the transport of its merchandise from the farm to the port four times what it spends its Argentine or North American competitor. "This makes our grain more expensive on arrival in China, despite the lower cost of production, and directly reflects the loss of capitalization of the national agrobusiness," said in an exclusive interview, Larry John Rabb Carvalho. At the beginning of the mandate of Jair Bolsonaro (PSL), the Ministry of Infrastructure has already announced as one of the priorities of the portfolio to ensure a more agile and safe flow of commodities between the Midwest and the ports of Arco Norte by BR-163. Land transport by this highway, however, is hampered by the obstacles provided by more than 1,200km of stretches with poor paving. The efficiency of Brazilian logistics therefore runs into primary issues in order to offer greater competitiveness to those who produce, operate and negotiate our goods, as well as causing greater expenses for the final consumer. Check out the interview with Larry Carvalho, one of the partners of Promare, a multidisciplinary consultancy based in Ceará and that has been investing with the goal of promoting the movement in the ports of Arco Norte. Portogente - What are the main logistical bottlenecks that Brazil needs to overcome in order to increase productivity and consolidate its role as a major player in the international scenario? Lately there has been a lot of talk about the need for investments between the production sites and the ports of Arco Norte. What role do the ports located in the North and Northeast have played? Larry John Rabb Carvalho - The productive zones of Brazilian agricultural commodities are largely far removed from the harbors where the crop is flowing, especially in the Midwest. For this reason, it is necessary to carry out long and time-consuming trips so that the chain interconnects. Besides the geographical challenge, we also have the precariousness of the transport infrastructure that is now available to the agents in this market. The productive zones of agribusiness depend almost exclusively on road transport. Modal that is known to be one of the most polluting, in addition to its high cost, especially after the freight tariff imposed by the Brazilian government. The cost that the producer has to pay for the Brazilian logistics deficiency is directly reflected in the loss of capitalization. The change in grain logistics and the use of the Arco Norte ports is urgent, as production in the Midwest should continue to grow in the coming years. According to data from the Mato Grosso Institute of Agricultural and Livestock Economics (Imea), it is estimated that soybean production is expected to grow by 17 million tons in the State of Mato Grosso until the 2021/22 harvest, while corn production is expected to grow around of 15 million tons. The ports of the South of the country, in turn, remain saturated by the enormous demand for cargo, which translates into increased time in port operations, inefficiency, risk of non-compliance with contracts and increased costs, especially with demurrage. There is still a huge imbalance in our logistics. However, it is auspicious to realize that it has already begun to be overcome. Just five years ago, the share of the North Arc ports was 8%, and now reaches 20%. The data, not surprisingly, show that, compared to 2010, the North Arc grew 356% by 2017. With a strong boost from China's interests, a series of transport and port projects are beginning to emerge from Brazil, which will shorten the route between agricultural production and ports, as well as reduce freight prices. In the North-Northeast there are already several port enterprises being built with predominantly Chinese capital, aiming to give greater capillarity to the flow of agrobusiness crops. It should be noted that during 2018 the Mato Grosso State Association of Soybean and Maize Producers (Aprosoja), together with the representatives of the Panama Canal, signed a memorandum of understanding to discuss ways to reduce the China in up to four days. It will be a new cycle of the North Arc, highlighting the new Panama Canal as logistics to the markets of East Asia or the American West Coast. 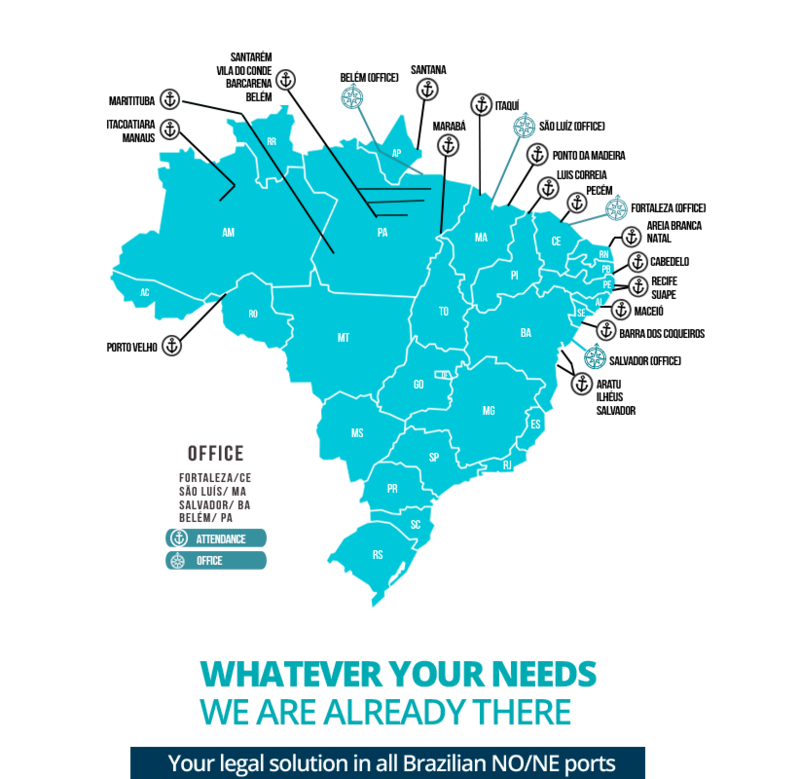 Portogente - What are the main logistical bottlenecks that Brazil needs to overcome in order to increase the productivity of the ports located in the North and Northeast? Larry Carvalho - The Chamber of Deputies, through its Center for Strategic Studies and Debates, conducted a dense study on the Northern Arc. Four causes were identified as being the major bottlenecks of the Arco Norte, all of them arising from what the Chamber classifies as "crisis of Brazilian administrativism". They are: fragmented model of transport management, uncoordinated actions of public agencies, lack of sources of financing and regulatory instability of the sector. Among the investments required, this study cites as priority investments in the Ferrovia Norte-Sul - Itaqui system (EF-151 SP / MG / GO / TO); the Ferrogrão-Tapajós system (EF-170 MT / PA-Tapajós) - transport corridors that feed the port hub of Belém. In addition to improvements in signaling, dredging and overfishing in the region's waterways. The study also states that a greater extension of the waterway could transport soybean and corn from Lucas do Rio Verde (MT) to Santarém (PA), with a 33.3% reduction in cost per tonne-kilometer. Portogente - How does Promare evaluate the potential of Arco Norte? What has the company done to help the logistics-port universe to offer better conditions for the users of these ports? Larry Carvalho - We believe in the potential of Arco Norte and that it will be fundamental for the development of agrobusiness in Brazil. However, in order for the Arco Norte to get off the ground and continue to be more attractive, it will be necessary to improve the various transport routes that lead to the different modes of transportation - road, rail and waterway. The development of the Arco Norte will favor the increase of agribusiness productivity, which, without costing the logistic inefficiency, will have the capital to invest in new agricultural technologies. In any case, the current projected increase in corn and soybean yields already makes it essential to develop the logistics of the Arco Norte, under penalty of bottlenecking of the production capacity of the projected crop. We at Promare believe in maritime trade. For 20 years we have been advocating the maritime and commercial mentality and guaranteeing our customers more legally safe and less bureaucratic business transactions. When ships carry and bring goods, they bring people from different countries, ethnicities, cultures, religions and legal systems closer together, making the world more peaceful and prosperous. In the past, the big challenges were storms; today, maritime commerce is plagued by sometimes incomprehensible norms and regulations, edited by distinct countries without the slightest trace of uniformity, disregarding the minutiae of business and commerce. The regulatory instability of the sector is something that generates enormous insecurity and with that the costs. In recent years we have been arduously defending the logistics of Arco Norte and the players that use it. In addition, in addition to our headquarters in Fortaleza, we have opened branches in Belém, São Luís and Salvador, considered as strategic points for service to the ports of the Arco Norte region.